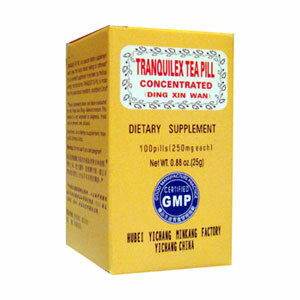 Tranquilex Tea Pill is a special dietary supplement which gives the body a steady feeling of calmness. Nourish blood, subdues Yang, tranquilize the spirit, calm the heart, clear heart Heat. Tranquilex Tea Pill is a special dietary supplement which gives the body a steady feeling of calmness. It is an excellent supplement to be taken by the busy working man and woman. Tranquilex is made from the purest natural ingredients available in China. Nourish blood, subdues Yang, tranquilize the spirit, calm the heart, clear heart Heat. Heart syndrome due to Deficient Heart Qi and Deficient Heart Blood with symptoms of palpitations, insomnia, anxiety, poor concentration, poor memory, dizziness, vertigo, hot flashes, dry mouth, restlessness, mental fatigue. Sinus tachycardia, neurasthenia, pre-menstrual syndrome, climacteric psychosis or involutional psychosis. Take 6 pills, 2 times a day.